When taking efficiency measurements of power converters, it is important to be able to measure input and output at the same timing. The WT3000E offers up to our input elements capable of simultaneous measurement of single-phase input/three-phase output, or three-phase input/three-phase output. 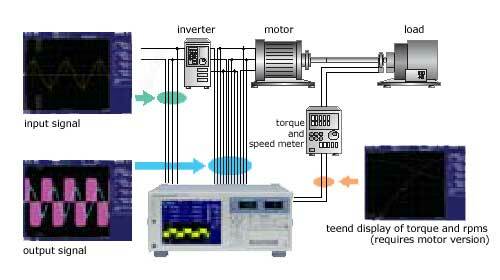 In evaluating inverter drive motors, one of the critical measurement parameters is the fundamental component of voltage. The mean is typically used for voltage measurement of sinewave-modulated PWM waveforms, due to the fact that the measured value from the voltage MEAN (rectified mean value calibrated to the RMS value) is similar to the fundamental component of voltage. However, motor drive technology has become more complex in recent years; pure sinewave-modulated PWM is less common, and cases in which the voltage mean differs greatly from the fundamental voltage waveform arise frequently. 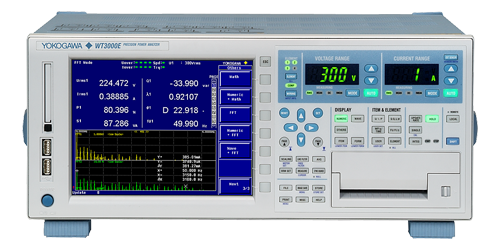 With the optional harmonic measurement function of the WT3000E (/G6 option), accurate measurements of commonly measured values such as active power and the fundamental or harmonic components can be taken simultaneously without changing measuring modes. With the delta computation function (/DT option), an object under test without a neutral line can be measured in a three-phase three-wire configuration, allowing calculation of each phase voltage. Instrument loss caused by the input resistance of the measuring device is, in principle, an unavoidable problem. Yet you can overturn conventional wisdom and obtain higher measurement accuracy by compensating for any potential instrument loss in the measured values. When measuring three-phase input/three-phase output with a three-phase four-wire system, you can measure input and output simultaneously by synchronizing between two units.